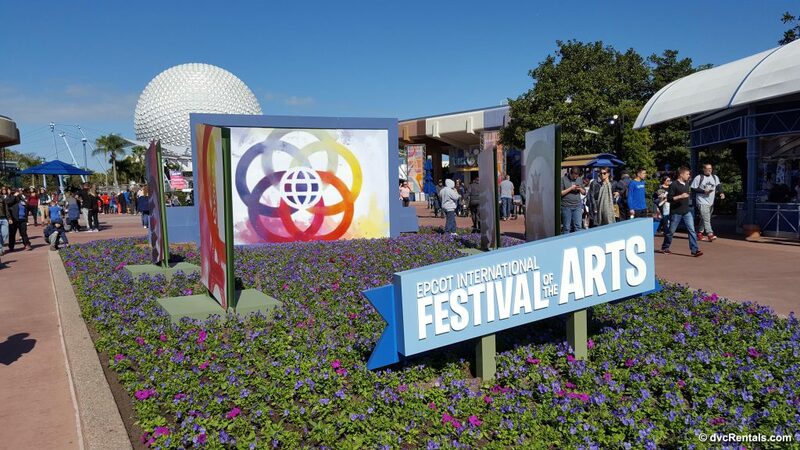 In 2017 Epcot unveiled a brand new Festival dubbed “Epcot International Festival of the Arts”. I was extremely impressed and was hoping the Festival would return this year. Happily it did, starting January 12 and ending on February 19. I was lucky enough to attend just 3 days after it opened, and I was not disappointed, I enjoyed it as least as much as last year, maybe even more, as new things were added. The Festival is true to its name. There is art of all sorts: Paintings, drawings, performance art, culinary artistry and more. When you enter Epcot from the Main Entrance you’re greeted with a beautiful topiary of Figment, who is holding an artist’s palette. He is surrounded by rainbows emanating from cans of paint; it’s very colorful and very inviting. Be sure to get a Festival Passport so you won’t miss anything. The passport also contains stickers to keep track of all the various experiences you encounter. There is a lot to do and see, hence quite a number of stickers are in the Passport. In addition to the Passport don’t forget to pick up a Times Guide. The Passport gives you an overview of all the events, the times guide will tell you when you need to be there for specific events. Times vary from week to week and sometimes from day to day. 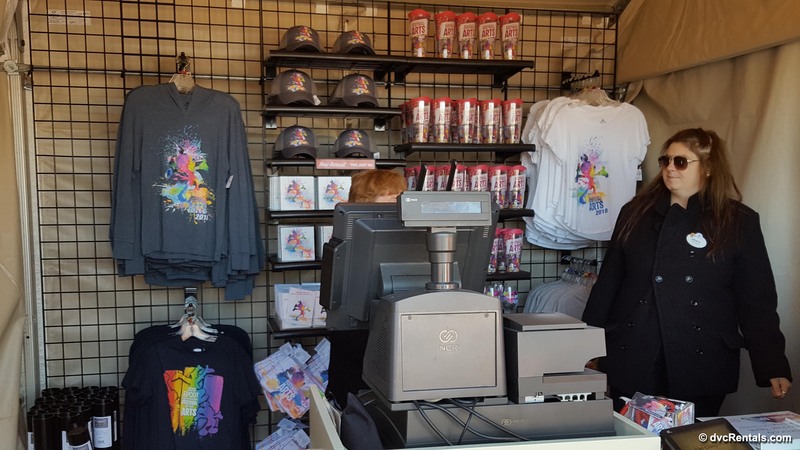 Passports and Times Guides can be found at the Main Entrance of Epcot, the International Gateway entrance to the park, and at most kiosks and large stores throughout Epcot. 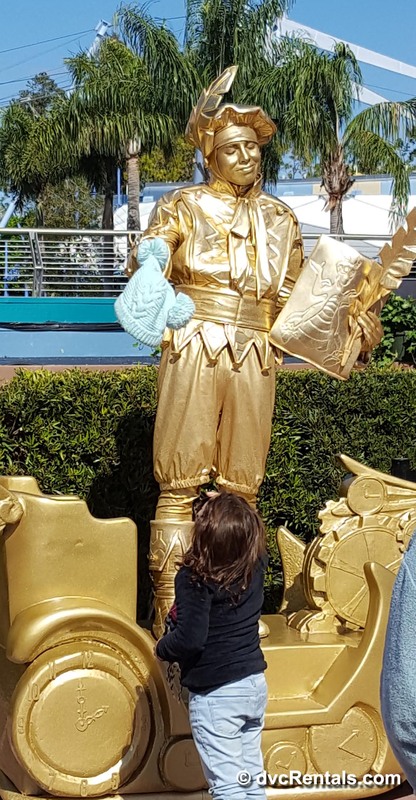 If you can’t find one or the other just ask a Cast Member, he or she will be glad to direct you. After you enter Epcot, the first area past the Welcome sign that has Festival-related events is the large fountain behind Spaceship Earth. At the far end of the fountain you will find some cool entertainment. There are a few main events here, and they are all worth seeing (this is where the times guide comes in handy). “Art Defying Gravity” is a group who perform feats of strength and skill that boggle the mind. They appear to defy gravity (as the name implies), as they swing one another around, and are new to the Festival this year. The “Living Statues” are awesome. People covered in metallic paint strike poses and stand perfectly still, (changing positions occasionally). Guests are welcome to pose with the “statues” and often when they do the statue will do something amusing for the photo. “Visual Art in Performance” is a sight to behold. The artist paints Disney characters at breathtaking speed, it’s amazing. “Disney Performing Arts Showcase” consists of local Florida Schools performing Jazz, Marches and other music; these are some very talented students. Continuing straight ahead to World Showcase is where you will find the rest (and the majority) of the Festival. Food booths line the path around the Showcase, although not as numerous as the ones you have seen if you visited during the Food and Wine Festival. But what they lack in quantity they more than make up for in quality. There are actual chefs who prepare the food and plate it. The platings are beautiful. 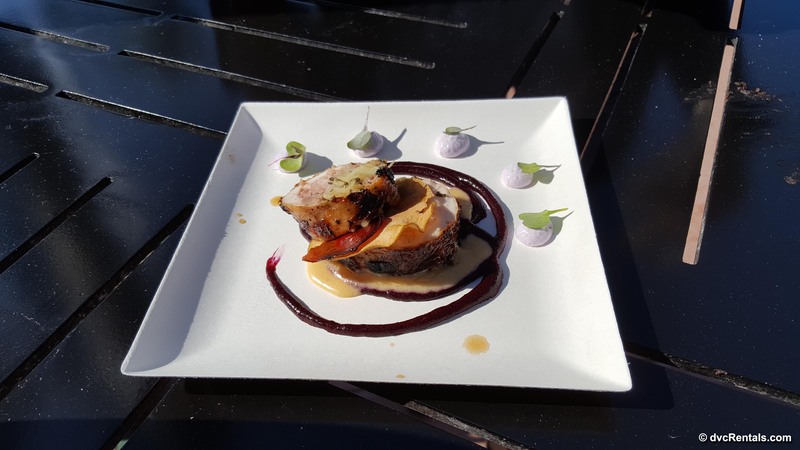 They don’t just put the food on the plate, they decorate it and make each serving a showcase of taste and beauty. I suggest you take the time to watch some of the dishes being prepared, I think you will find it impressive. 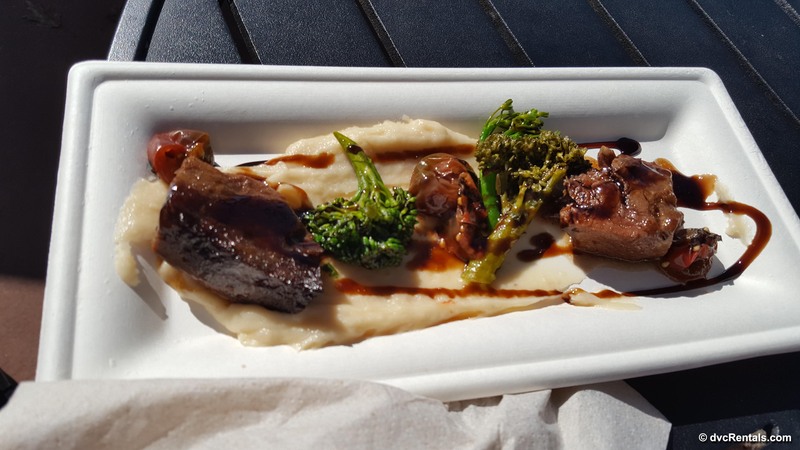 My personal favorite dishes were the chicken roulade (found at Pop Eats on the Showcase Plaza), Shortribs from Germany, and the Smores Tart at Decadent Delights (also on the Showcase Plaza). I am looking forward to going back to get more of all three. There are a number of internet sites that list all the food items available, it is a good idea to check out the options before you go, so you have some idea of what you’d like to try. The Festival Showplace, located at the Odyssey House near the Mexican pavilion, has a lot going on. 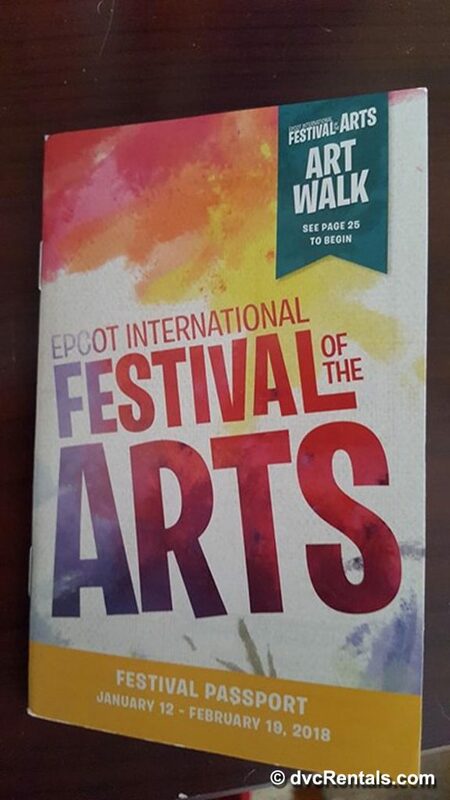 There are Workshops (for a $39 fee) with professional artists (call 407 WDW-TOUR to book). Examples of Workshops are Animation 101, Doll Making, Calligraphy and Cartoon Portraits. You’ll also find seminars (no fee) offered on various types of art: Painting, Animation, Photography, Food Art, Casting Bronze, Stained Glass, topiaries and more. Again, check the times guide, the times and topics tend to vary quite a lot. The Festival Showplace also has an Animation Academy, where YOU can learn to draw a Disney character. The times guide lists this currently as “intermittently”, so it seems you just have to be lucky to catch this event. I also noticed folks making custom t-shirts in the Showplace—and don’t forget they sell some great food there too. 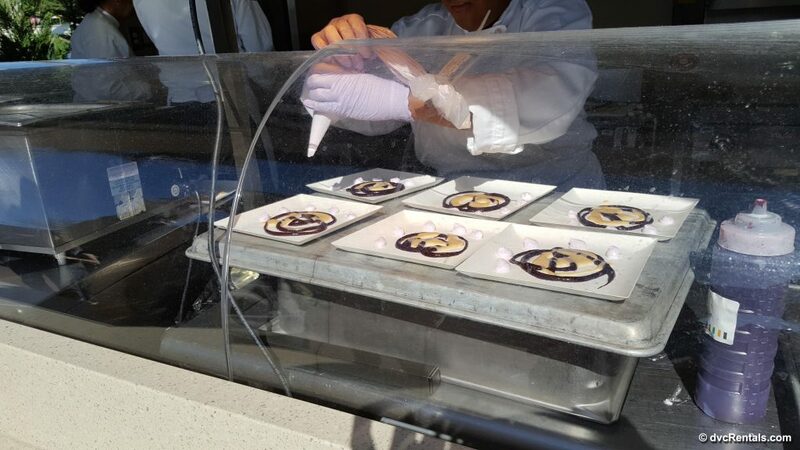 As you walk around World Showcase there are a number of sights and tastes to enjoy. There is a lot more art this year than last year, and many artists are present to talk about and sign their work. There is Disney Art, Fine Art, Landscapes, 3-D “box” art, photographic art and more. I was seriously impressed with the variety and talent of the artistry. 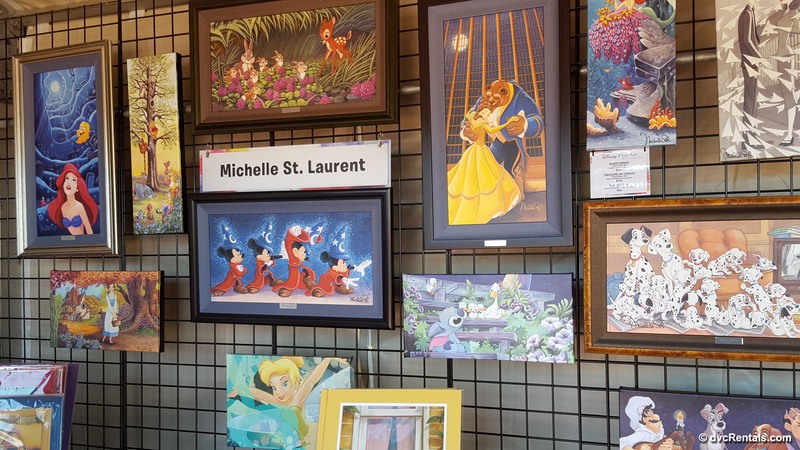 Some well-known Disney artists are making appearances on various days, Jasmine Beckett-Griffith and Larry Dotson are just two of the names you might recognize. 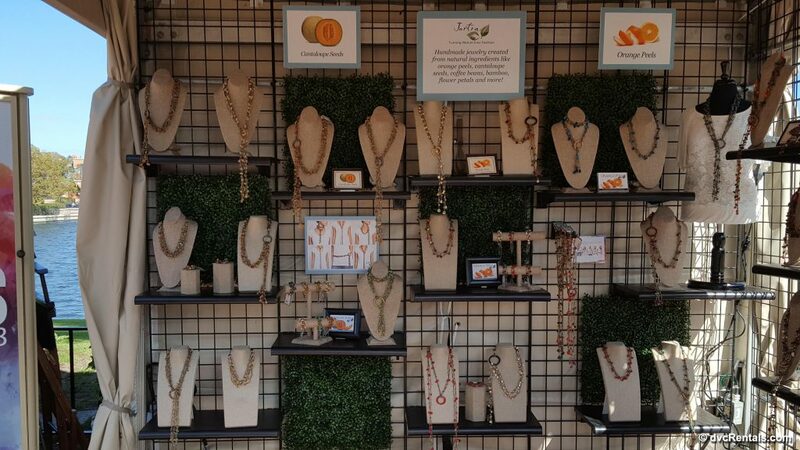 You will find jewelry art, tie dye, “make your own scarf” and other artsy fun things to do and observe. One jeweler made all of her creations from seeds, leaves and other parts of flowers and plants! You’d never know by looking, it appears to be “regular” jewelry until you read how it was made (and she was more than happy to talk about it with guests). One of my personal favorites, along with many other guests, is posing in the large cut-outs they have of famous paintings. 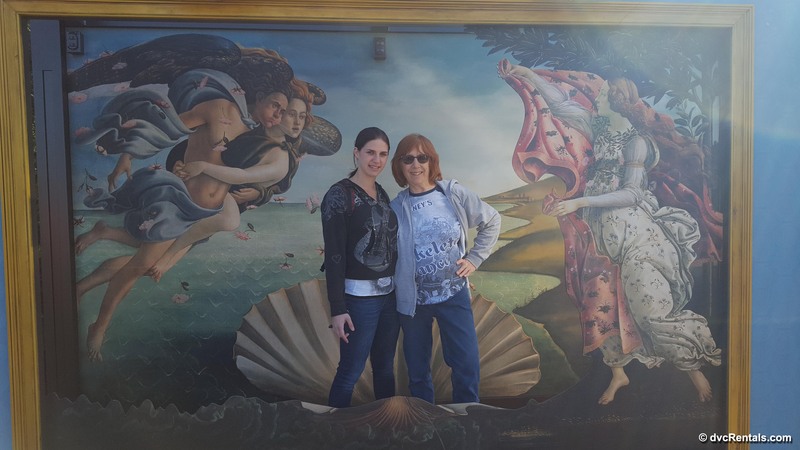 When photographed, it appears you are in the painting! There are a number of these as you walk around the showcase, and plenty of photopass photographers to document the fun. They will gladly take your pic using your camera if you don’t have photopass (or even if you do). Another interactive exhibit called “Expression Section” has guests joining to create a large mural of figment. 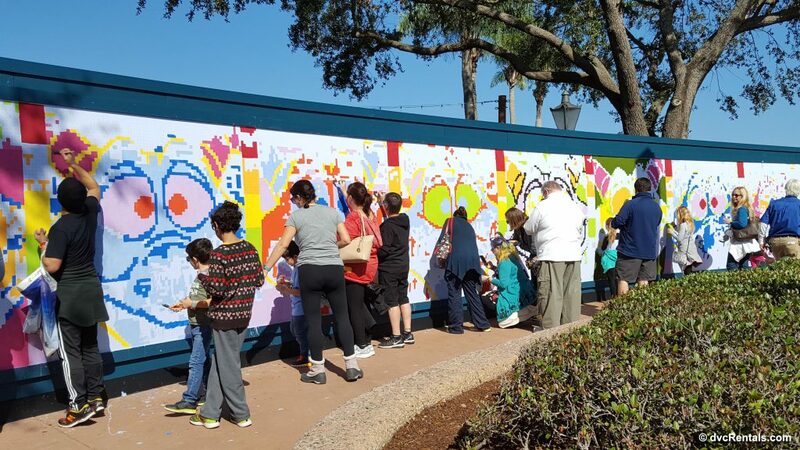 Located on the World Showcase Plaza, you’ll be given paint and an area to “color in” to help make the mural. If you like Disney show music be sure not to miss the “Disney on Broadway Concert Series” at the Festival. Located in the America Gardens theater (across from the American Pavilion), performances are Fridays through Mondays at 5:30, 6:45 and 8:00. As the title implies, these are concerts done by Broadway entertainers who were in Disney shows. Shows that are highlighted include Newsies, Tarzan, Aladdin, Little Mermaid and more. And yes, you guessed it—check the times guide so you know who will be there, and what shows to expect to hear songs from, when you are visiting. As an FYI most of the usual World Showcase musical acts (ie Mariachi Cobre) still play during the festival. For those who can’t make it this year I hope the festival continues for many years to come. It is a feast for the five senses, enjoyable in so many ways, and it’s a great way to introduce children to various types of art. I think Walt would have really liked this Festival, because it’s truly fun for the entire family.